As the Iowa caucuses near — and front-runner/self-described potential Fifth Avenue shooter Donald Trump commands outsized headlines — it’s time for a Westport-connections story. Everything here is true. I couldn’t make this up — even if I wanted to. JP Vellotti is a longtime Westporter. About 10 years ago — working as a photojournalist — he was a stage photographer for ABC Studios in New York. He worked mostly on the Tony Danza morning show. It was filled with B-list guests, but the host was always polite and attentive to his staff and crew. JP never knew who would be on the show until he arrived. One day, during the height of “The Apprentice,” it was a rare A-lister: Donald Trump. He was there to promote his show, plus an officially licensed line of board games, towels, etc. In typical The Donald fashion (literally), he brought suits with his own label to plug too. The staff found some mannequins, and rolled them onstage. Trump was — well, Trump. But it’s what happened afterward that JP never forgot. As the star was leaving, JP mentioned he’d read his book. “Did you like it?” Trump asked. Trump — carrying one of his suits from the segment — immediately asked JP what size he wore. “44 regular,” JP replied. Trump handed it to him to try on. It was awful: baggy, badly cut, with very cheap fabric. But JP thought it was a nice gesture for Trump to give him a suit. “This is a 46 long. It’s too…” JP protested. JP actually started thinking, This is a good deal. But he looked at the pants: They were a 40. He’s a 36. 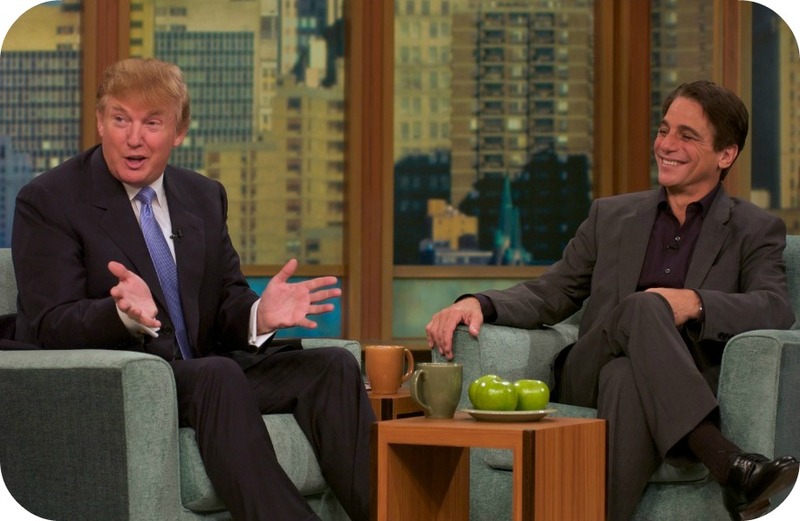 It’s hard to imagine the insanity of haggling with Donald Trump, in the back of a TV studio. He clearly didn’t need the money — or to sell a suit — but JP could tell he was burned at not being able to make the deal. As he walked away, Trump moved on to someone else. Since then, JP has always thought of Donald Trump as a cheap suit salesman. But he really is a master negotiator. Perhaps, JP says, “if he can’t convince America of his latest deal, he can try somewhere else. 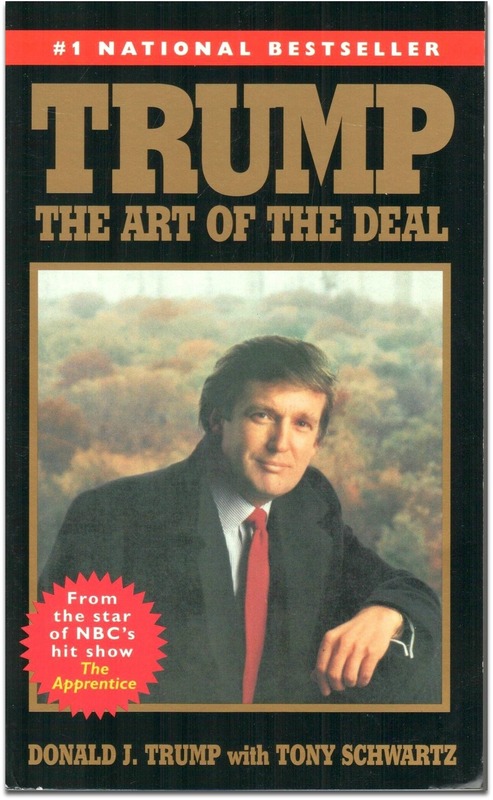 This entry was posted in Media, People, Politics and tagged "The Art of the Deal", Donald Trump, JP Vellotti, Tony Danza. Bookmark the permalink. Don’t feel too sorry for The Donald. He’s in his element with empty suits as companions. He likes to negotiate…and win. Maybe what we need is someone who wants the country to win, for a change. A good thing. A cheap huckster selling things that just don’t fit. If that’s not a metaphor for Donald Trump’s presidential aspirations, I don’t know what is. I agree with Mary Ruggiero, it’s about time we had someone who can negotiate and wants us (USA) to be the winning team. Donald Trump is a salesman. He’d sell his own grandmother if he thought he could make a profit on her. Imagine if he thought he could get a profit from selling our National Parks to foreign countries. Heck, he could even sell his books and suits in their foreign run gift shops! I wonder what kind of a deal he’d make with the Uruguayans for Yellowstone? OMG… the scary part is the Mary’s are drinking the Kool Aid…. Are you sure who is drinking the Kool Aid? When I was growing up, we didn’t have sugar laden desserts or drinks in the house, makes for a rather realistic taste for things. Maybe there’s another type of Kool Aid going around and others are partaking of it. Just another way to look at things – and btw – I didn’t say I was a Trump supporter. With or without him, I will be listening carefully on Thursday. And the twain shall never meet ….. Exactly what I was thinking too. Even back in the 80’s, when I recall first hearing about him, he was someone who was associated with spectacle rather substance. If anyone reads Vanity Fair Magazine, Editor Graydon Carter has been having fun with The Donald for years (ever since his “Spy” magazine days) about Donald’s small hands. Apparently, this really bothers Trump – Hmmmm. I wonder if Putin’s hands are bigger? God help us. What have the good people of Uruguay done to you? Suggesting that Trump should try a place like Uruguay is plain scary for all Uruguayans. Also, on behalf of all my Latinamerican brothers and sisters please abstein from any suggestions of Mr. Trump doing any kind is business -like the golf courses in Scotland- Sourh of the border. Well, that wasn’t my comment. It was PJ Vellotti’s! Haha Dan, I don’t think we will be hiring The Donald here @ Suited.co… JP if you want something that fits come see me! Thanks. I have nothing against Uraguay..,it was just the furthest place from 06880 that I could think of at that moment. Thank you JP and Dan for sharing the story. JP, soon space tourism is going to be a reality. I’m hoping the Donald decides to do something in outer space and stay there… Perhaps rule over some kind of sub-human life forms. JP: You should definitely check out Suited.Co. The suits are waaaay better than The Donald’s! That’s a very revealing story, I think.